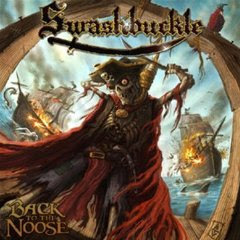 Hall of the Mountain King: Review: Swashbuckle, "Back to the Noose"
I can't deny the little tingle of excitement I had when I read the description of Swashbuckle -- a thrash pirate metal band. Pirate metallers Alestorm have been one of my happiest discoveries of the past few years, and thrash is my preferred subgenre of the metal world. I couldn't wait to get my hands on "Back to the Noose." My initial reaction to the music here was a bit of disappointment. Rather than a pirate thrash album, this seemed to be a thrash record that just happened to have songs about piracy. I missed the quirky folk elements that Alestorm brings to the table. Once I got past that initial disappointment, I had to admit, though, that the thrash elements of the record were pretty solid. 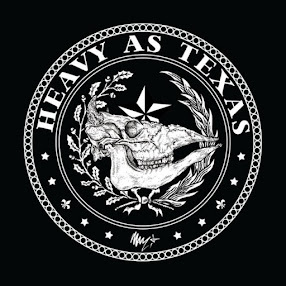 They're short, punchy songs with plenty of speed and intensity to spare. The blazing riff and memorable chorus of the title track is a perfect example of what this band does best. "Peg-leg Stomp" opens with an appropriately grooving thrash stomp, which returns on the chorus, making it one of my favorite tunes here. "No Prey No Pay" bashes away with an S.O.D.-like assault that's a staple for many of the thrash numbers. "The Grog Box" opens with a bouncing riff and blends in just a little traditional metal influence in the guitar melody, while "Attack" just bashes the listener over the head. A few of the tracks give me the kind of thing I was really expecting from the record. "Rounds of Rum" is another favorite, with it's sing-along drinking song feel. "Splash-n-Thrash" is a close second with some guitar work that has that pirate movie soundtrack feel and a great, heavy breakdown. There are some interesting piratical interludes that are hit and miss. Album opener "Hoist the Mainsail" is an excellent mood-setter. "Cloudy with a Chance of Piracy," on the other hand, sounds (I suppose, appropriately) like something you'd hear during the forecast on the weather channel (or maybe in the background at a seafood restaurant). Some are almost like checking in at different ports of call. "Carnivale Boat Ride" has a bit of a Celtic feel, "La Leyenda" has an interesting Spanish flavor, "Tradewinds" features some medieval influence. Some just get in the way, like the goofy skits "Rime of the Haggard Mariner" and "All Seemed Fine Until," which the record could really have done without. But when they get the interludes right, they work well, particularly the piece "Shipwrecked" near the end of the album, which is perhaps the most impressive and moving of the interludes, at least until the spoken word poetry bit comes in. Despite that, though, I think the interludes and attempts to be more "piratey" work against what's a pretty solid collection of thrash tunes. Even though some of them are interesting, more often they just get in the way and slow down an album that, for the most part, is anything but. Get "Back to the Noose."